Reporting - jason wiener | p.c. Jason Wiener|p.c. is proud to be Colorado’s first Public Benefit Corporation to become a certified B Corp. 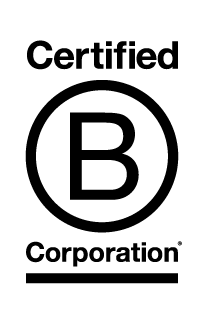 The B Corp certification is administered by B Lab, a nonprofit organization based in Pennsylvania. The B stands for “benefit,” which refers to benefiting workers, the community and the environment. Jason Wiener|p.c. became a certified B Corp in 2015, joining over 1,200 certified B Corporations in over 120 industries in 40 different countries. To qualify as a B Corp, a firm must have an explicit social or environmental mission, and a legally binding fiduciary responsibility to take into account the interests of workers, the community and the environment as well as its shareholders. 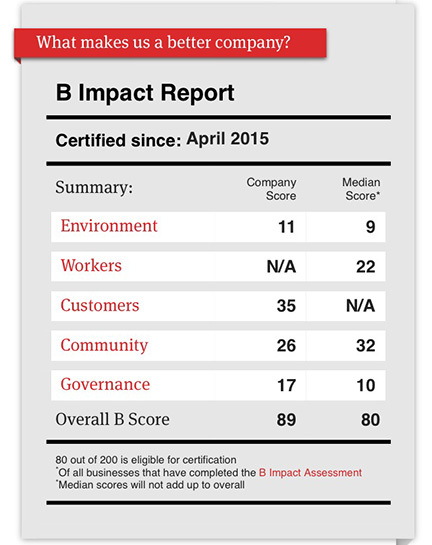 Additionally, B Corps must pay an annual fee based on revenues, biannually complete a B Impact Report (a rigorous assessment that measures social and environmental impact), meet B-Lab’s comprehensive social and environmental performance standards and make that B Impact Report public, in order to receive the certification from B Lab. To become certified, each company must attain a score of 80 out of 200 points on the B Lab Assessment. Jason Wiener|p.c. earned a company score of 89 in the firm’s first Impact Assessment, placing it in the top 25% of all B Corp certified law firms.